We four have gathered once more in Manchester, for the final climax of our tale. The story trail has been underway for the last 10 days, taking participants to interesting places around Manchester where they are discovering digital and non-digital surprises, and fragments of the story. On Friday evening the story will culminate in a live performance on a canal boat, and our current task is to refine the script and rehearse the performance. Maya has been giving guided tours of the story trail, which have been popular with people who aren’t familiar with the technology (which is most people, since we are using the very new Zappar codes and geocaching which is quite a niche activity) as well as with those who appreciate the personal touch and extra information they’re able to get on the tour. At the end of each tour Maya has been doing a microprojection, usually onto the dark canal waters. This evening it was too wet for the tour, so we went to a poetry reading at the Manchester Central Library and afterwards did the microprojection outside the library as the audience left. It was still raining heavily, which meant we had to take care to keep the projector dry, and people weren’t going to stand around very long looking at it. But the rain did provide a nice wet concrete surface on which the projection showed up very nicely. As people walked over the text they did a double-take and looked back to see what it was, some bemused about where it was coming from. I’ve also learned how to fold an origami narrowboat as part of this project. It’s harder than it looks! But now that I’ve got the knack of it, I’m finding it very meditative. The boats, which give another fragment of our story, have been distributed around various festival venues and will also be available at the performances and guided tours. Tomorrow we will mark out the performance space of the boat on the floor of our rehearsal room at Z Arts, make the final tweaks to the script and rehearse for the three performances on Friday night (book now if you haven’t already – the first two are nearly full!). And on Saturday, Sarah and I will give our workshop, which follows on from the workshop Maya and Michelle gave last Saturday – reviewed here by a participant who can’t wait for the next part. 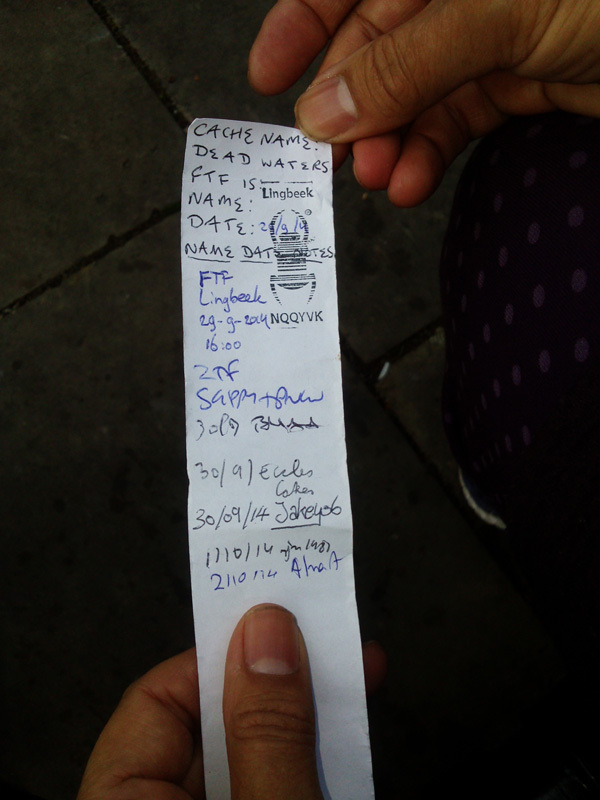 Once of the nice things we’ve discovered about using geocaching in our project is the feedback: when someone finds a cache, they write the date and their name on a paper log inside the cache, and they can also post a digital log to the cache’s listing, via their geocaching app. Most of our six caches have been in place for a week already, since we needed to be sure the listings would all be approved in time (both Opencaching.com and Geocaching.com rely on volunteers to check and approve all new caches – thank you!). 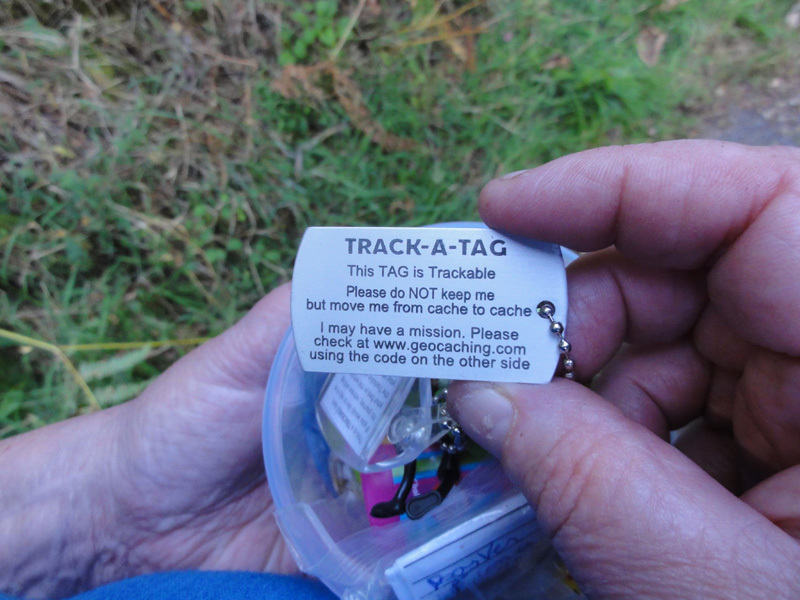 As soon as each cache was approved and appeared on the site, keen local geocachers were out there hunting for them – sometimes within an hour or so of the cache being made public. And as they found – or did not find – each cache, they entered logs and we received email notifications. It has been hugely satisfying to get this instant feedback – especially as many have cottoned on (pun intended!) to the fact that it’s a story series. Many have also complimented the design of the containers. It was also very helpful for us to learn that one of the caches was too well hidden; its log contains several “DNF” (did not find) entries, and the cachers responses to each other’s difficulties. You’ll be pleased to know we’ve moved that cache and now it is finable. We were also a bit out with the coordinates for a couple of caches, and have updated those thanks to information provided through the logs. Even before it was officially open, the story trail is clearly a hit with geocachers. The challenge ahead is to get the geocachers interested in the other parts of this multifaceted project, and to encourage non-geocachers, or rather new geocachers, to leave a digital log as well as sign the paper – and go on to find other caches if their curiosity is piqued. Cross-fertilisation between Manchester’s literary and geocaching communities may be about to take place! You can view the caches here and scroll down to read the logs. You can also view the caches on Opencaching.com – but no-one has posted a log here yet. Why don’t you be the first? View the map of where the caches and Zappar codes are.